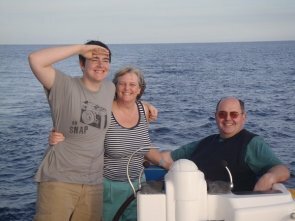 Today we sailed over to Tenerife to go and see Mt Teide, the volcano which also happens to be the highest peak in Spain. There was little wind so it was about 9 hours of motoring and one hour of sailing. 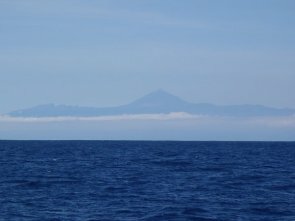 Andrea took this photo is of our approach to Tenerife, with Teide sticking out above the mist. Our visitors seemed to be having a good time, despite the small amount of sailing. This evening Bertie had the best meal invention he has ever encountered. A "Secret Iberico" pizza style, which is basically a slab of fried pork covered in tomato and cheese pizza topping. "A pizza without the pointless stuff".